On a foggy morning at Wright Air Field in Dayton, Ohio on October 30, 1935, a flight competition was held for the top airplane manufacturers to win a tender from the U.S. Army Air Corps for the next-generation long-range bomber. Boeing Corporation’s Model 299, a cutting edge aluminum-alloy plane that could fly faster, further and carry five times as many bombs than the army had requested, was sure-fire to win. Nicknamed the “flying fortress”, historians stated this competition was held as a mere formality, with Boeing almost guaranteed to secure an order of at least sixty-five aircraft’s. As Boeing’s turn to demo the Model 299 arrived, a small crowd watched the plane taxi down the runway readying for takeoff. It was magnificent, sporting four engines rather than the standard two. The plane roared down the runway, took off smoothly and rose quickly to 300 feet. But then the unimaginable happened. The plane stalled, sending thousands of tons of metal and fuel spiraling back down to earth impacting in a fiery explosion. Investigations into the crash revealed that a “pilot error”, not a mechanical failure was the cause of the crash. The new design with four engines added significant complexity to the operation of the plane. The pilot had to tend to all four engines while monitoring wing flaps, fuel and a dozen other new buttons, levers and gauges. While tending to all this, the pilot had forgotten to release a new locking mechanism on the elevator and rudder controls. The plane was deemed too complicated for one man to fly, causing Boeing to lose the contract to a competitor’s smaller design. Boeing nearly went bankrupt. All was not lost, however; a few insiders still saw the potential of the Boeing Model 299 so the army bought a few units as test planes. A group of test pilots gathered together to decide how they were going to avoid the same mistakes and make the plane flyable. Interestingly, they decided to not make pilots undergo further training, but instead came up with an ingeniously simple approach: they created a checklist for the pilots. The fact a checklist was even invented was a tribute to how far the aeronautics industry had come. In the past, flying may have been nerve-racking, but it was never so complicated that a checklist was required. 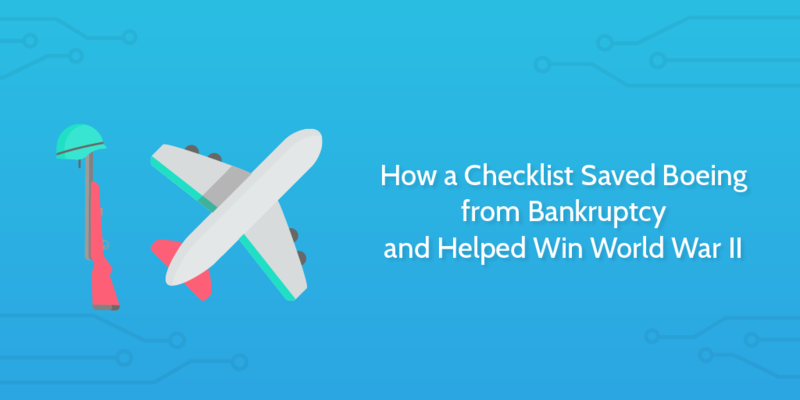 The checklist was simple, small enough to fit on an index card and covered menial tasks such as checking the doors and windows were locked and the elevator controls were unlocked. It’s difficult to think that something as simple as a checklist could make that big of a difference. But with this powerful tool in hand, the pilots of the Model 299 were able to fly the planes a total of 1.8 million miles without one accident. Boeing ended up selling thirteen thousand units, giving the US Army an unprecedented air advantage in World War II and enabling its devastating bombing campaign across Nazi Germany. Today, society and technology have advanced so far that most humans find themselves doing complex activities on a day-to-day basis, even more so for knowledge workers. The Checklist Manifesto by Atul Gawande has created a movement behind this simple way to meet these complex needs. Process Street is built on the premise of the checklist and the art of making complex tasks simple. We’ve created this Checklist Manifesto software because even the most experienced pilots can sometimes forget. A great reminder that sometimes the most complex systems can be tamed with simple tools. Simplicity is often the best route.